Designers Fountain 30511-AM-BZ Westchester Collection 1-Light Exterior Wall Lantern, Bronze Finish with Amber Glass | Fountain City Art Ctr. 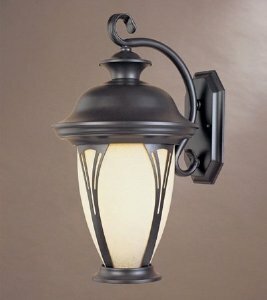 Designers Fountain 30511-AM-BZ Westchester Collection 1-Light Exterior Wall Lantern features a rich Bronze finish complemented by a warm Amber glass in a classic Tuscan design sure to be appreciated for years to come. Install on a front porch or garage, or anywhere within your outdoor theme a little more traditional charm might be needed. The 30511-AM-BZ is 7-Inch wide by 12.75-Inch high by 9-Inch extension from the wall. The fixture requires one 100-Watt medium base incandescent bulb (not included), dimmable using a standard incandescent dimmer. The 30511-AM-BZ comes one per package. Designers Fountain has been a leading manufacturer and distributor of decorative and functional residential lighting the United States since 1985. Headquartered in a state-of-the-art facility in the Los Angeles area, our products are available through a network of authorized lighting showrooms, distributors and internet experts throughout North America. Our philosophy is to continue to provide the highest quality products to meet all your lighting needs. Whether you are searching for traditional, transitional or contemporary styling, the breadth of our product line allows you to indulge your creative instincts at an affordable price.